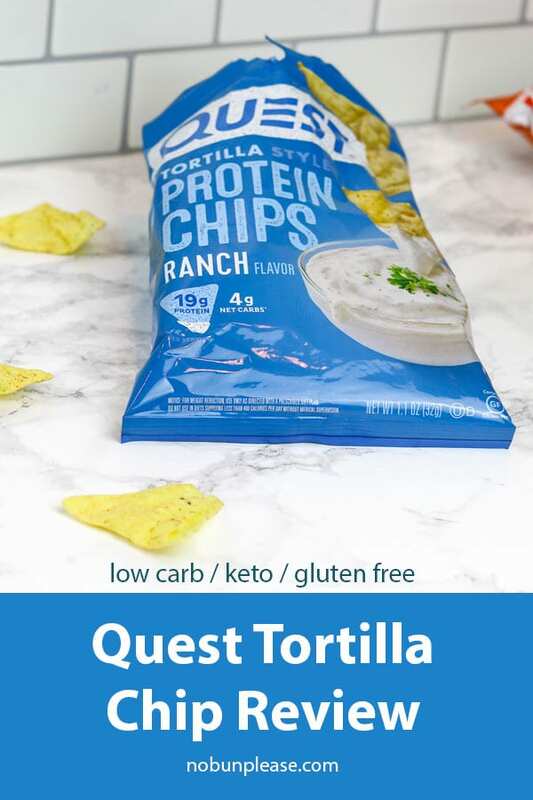 I have been seeing the Quest Tortilla Chips floating around on Instagram for a while now, and most seem to offer them nothing but praise. I finally caved and ordered my own to see if they live up to the hype. Would this satisfy my longing for Keto-friendly Doritos? You see, these are the questions that ultimately leave me lying awake at night. What did I think of the Quest Tortilla Chips? Keep reading to find out! This review will be for the Nacho and Ranch Quest Tortilla Style Protein Chips. Recently, Quest Nutrition also released a Chili Lime flavor. If there’s enough interest, I could probably pick up some of those to review as well. These chips are baked (not fried) and are suitable for almost any diet. They boast a nutrition profile that is low in calories and carbohydrates, the perfect snack for low carb or Keto. For a convenience food, the ingredients could be a lot worse. Most of the ingredients are pronounceable or something I’ve encountered before. Nacho: Protein Blend (Acid Casein, Milk Protein Isolate, Whey Protein Isolate), High Oleic Sunflower Oil, Calcium Caseinate, Corn Starch, Natural Flavors, Soluble Corn Fiber, Psyllium Husk, Salt. Contains less than 2% of the following: Cheddar Cheese Powder (Cultured Milk, Salt, Enzymes), Romano Cheese (Milk, Cultures, Salt, Enzymes), Buttermilk Powder, Butter (Cream, Annatto), Tomato Powder, Onion Powder, Spice, Nonfat Milk, Whey Powder, Chia Seed, Paprika Extract (Color), Turmeric Extract (Color), Sunflower Lecithin, Calcium Carbonate, Yeast Extract, Steviol Glycosides (Stevia). These bags of chips are also gluten-free and not made with any soy. They do contain dairy however, if you’re avoiding or watching for that. I like that these pack a bit of protein too — I would much rather have a bag of these than a protein bar any day! As soon as I tried the first chip, I was flooded with awesome ideas: a great movie snack, the perfect vehicle for a low carb walking taco, loaded nachos with all the fixings, etc. Flavor-wise, the Quest Tortilla Chips are AMAZING. Both the Nacho Cheese and Ranch are bursting with flavors and really do mimic the flavors of their Dorito counter-parts. If you’ve ever had the generic brands of Doritos, the flavors are very similar. That is in no way an insult to the flavor — in the past I’ve had generic Doritos that tasted even better than the real thing! It’s not the same exact flavor, just slightly different. The Ranch has a really zesty buttermilk flavor, which I appreciate. Almost smokey in a way. Definitely has a nice bite! The Nacho Cheese flavor is tangy and perfectly cheesy. Don’t let the red color deter you — these are so good that you’ll be licking your fingers when you’re finished! They do have a slight protein taste to them, but the seasoning on the chips help mask this extremely well. Overall, I’m extremely impressed with how they taste. From a texture standpoint, the Quest Tortilla Chips are very crunchy. Compared to Doritos, they’re definitely a lot lighter, thinner and smaller in size. They’re also fairly fragile, so take caution when handling. Each triangular protein chip is coated in their signature spice blends. The Nacho Cheese seems to have more flavor, and as mentioned previously, there’s enough of it to leave a trail on your fingertips. Some may find this annoying, but I think it’s part of the charm — just like regular Doritos! Pricing for the Quest Tortilla Chips come out to a little over $2 a bag — not too bad at all! You can find them at most GNC stores, some grocers and from various retailers on the Internet. If you have a Prime membership, Amazon has them priced pretty fairly with FREE 2 day shipping! While these low carb tortilla chips tick the boxes for flavor and texture — and are close to mimicking the real thing — don’t expect Doritos when you buy this snack. However, they are delicious and seriously, close enough! If your intentions were to find a chip great for dipping, this probably isn’t it. These Quest Tortilla Chips are delicate and will likely break into your dips. My Crispy Cheddar Crisps may be a better option — they stand up much better to dipping. If I had to choose a favorite flavor, I’d have to go with the Nacho Cheese. The amount of cheese they put on these chips is impressive and I love to eat them crushed on top of my taco salads. So good! Absolutely. I could see these becoming a staple for me. They’re great on their own (as intended) and also work well in meals, too! I also love that you can pick these up at GNC. This provides easy access for when traveling or on the go, and eliminates the need to make a special online order. Unless you want to, of course. 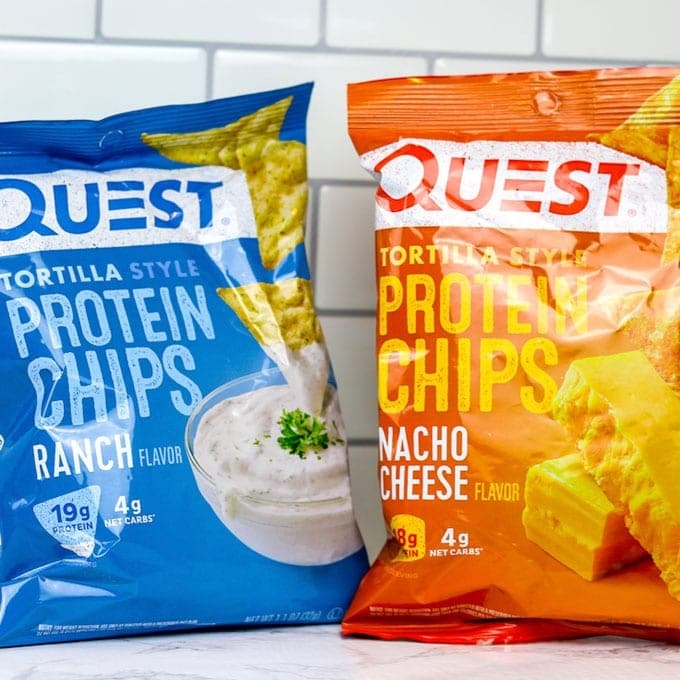 Have you tried the Quest Tortilla Chips? What did you think? I’ve tried the nacho cheese chips and they are so yummy! I do actually dip them sometimes as well but I agree they are delicate. I will have to try the ranch ones next! Thanks for posting!